Can a NIT Championship Redeem BYU’s Season? A NIT Championship would be big for senior Kyle Collinsworth (above) and the BYU Cougars after missing out on the big dance. However, they will have to get by a good Valparaiso team in the NIT Semis first. It has been a bit of a disappointing season for Dave Rose and the BYU Cougars, who failed to make the NCAA Tournament for only the second time since 2007 (the other time they missed was in 2013). Considering they had all-around Swiss Army knife Kyle Collinsworth returning, many figured the Cougars would at least challenge Gonzaga and St. Mary’s for the WCC crown or at least an at-large NCAA Tournament berth. Unfortunately, though the Cougars posted a respectable 22-9 record and 13-5 mark in WCC play in the regular season, their campaign was marred by some head-scratching losses. On November 16th, their second game of the year, they lost 66-65 to a Long Beach State team that ranked 90th overall according to Ken Pom. However, that was only the tip of the iceberg as the Cougars also lost to Portland (ranked 212th according to Ken Pom) 84-81 and Pepperdine (139th) 71-65 on the road and Pacific (233rd) 77-72 at HOME (safe to say, the loss to the Tigers, who were playing with an interim coach, pretty much sealed the deal when it came to their candidacy as an at-large selection). The Cougars had some good wins on their resume, including beating Gonzaga in Spokane and St. Mary’s in Provo, and over New Mexico and Northern Iowa (a tournament team) on a neutral court. But the bad losses just haunted them throughout the year, and that was a key reason why they weren’t even hoping for an at-large spot on Selection Sunday. Luckily for Cougar fans though, BYU did not take participation in the secondary-tournament as a slap in the face or a measly consolation prize. Unlike St. Mary’s, who was throttled against Valpo on the road in the third round of the NIT, the Cougars made the Final Four of the NIT at Madison Square Garden, where they will face the same team that easily dispatched the Gaels a week earlier. Let’s take a look at the Cougars’ prospects and what a NIT championship would mean to BYU going forward. BYU has gotten some good wins in a NIT tournament that was loaded with worthy opponents who certainly deserved at-large consideration. They easily beat UAB, who was the regular season Conference USA champion (and whose coach is now the head man at Stanford) 97-79 in the first round of the tournament, and won an 80-77 nail biter against a much improved Virginia Tech team that will look to be a dark horse next year in the ACC under Buzz Williams, the former Marquette coach who will begin his third season next year. But the biggest win was over a Creighton team that looked a whole lot better statistically (ranked 40th in Ken Pom) than their record (20-15). In an up-tempo shootout (76 possessions) in Provo, the Cougars outscored the Jays 88-82 to clinch a Final Four spot in Manhattan. Now, the Cougars will go against a Crusaders team more known for their defense than offense, something that the Cougars really didn’t see so far in the early round of the NIT (all the teams had higher adjusted offensive ratings than defensive ones). Valpo’s 92.7 points per 100 possession adjusted defensive rating was 8th best in the nation, and was key in big wins for them this year over the Gaels, Oregon State and Iona (the last two being NCAA Tournament teams). Unlike the Cougars, who like to push the tempo and get off quick shots as evidenced by their 74.2 adjusted tempo (11th fastest in the nation) and 14.5 second average possession length (7th fastest in the nation), the Crusaders prefer a slower, more half-court-oriented approach. Head Coach Bryce Drew’s (yes, this same Bryce Drew) squad posted a tempo of 67.2 (263rd fastest in the nation) and had an APL of 17.6 (206th fastest). That being said, just because they are slower in their approach doesn’t mean the Crusaders are a “throw it in the paint” kind of team. Instead, they are a very perimeter-oriented squad that can torch teams from beyond the arc. 32.4 percent of their points come from 3-point land and they play a pretty deep bench, as their 36.1 bench minutes percentage is 71st highest in the nation. Add that with an experienced squad (they are the 31st most experienced team in the nation) and some key players in combo forward Alec Peters (his 129.5 offensive rating was 13th best in the nation) and senior guard Keith Carter (his 29.3 assist rate was 98th highest in the nation) and the Cougars will certainly have their hands full tonight. The matchup between Peters and Collinsworth will be an interesting one to follow as whoever has the better night could be crucial in whether or not their team will garner a berth in the NIT Championship game. If the Cougars do get by Valpo, a potential old-school MWC matchup with San Diego State is a possibility, as the Aztecs face George Washington after the BYU-Valpo tilt. Much like the Crusaders, Steve Fisher’s squad relies on defense, as they ranked 2nd in the nation in adjusted defensive efficiency (89.9). Without a doubt, whether it’s tonight or in the Championship, BYU will have to make their shots and pick it up on the defensive end against two very good defensive squads. The Cougars like their fast pace-style, as they have only played in 5 games this year where the possession mark was under 70. In order for the Cougars to maintain that pace, they are going to need to own the glass and generate turnovers on the defensive end, since Valpo (and maybe San Diego State) won’t exactly feed into BYU’s “early shot” tendencies. The NIT isn’t the NCAA Tournament, make no mistake about that. However, while BYU’s chances seemed shot after their loss to Pacific, Valpo and San Diego State were two teams who had legitimate beefs with the NCAA Selection committee. Valpo beat Oregon State and was ranked 31st in the nation (almost 30 spot higher than the Beavers) according to Ken Pom. San Diego State was the best MWC team by far and was ranked 32nd in Ken Pom Ratings. If BYU can beat both of those teams on a neutral court, not only will it be a satisfying end for Rose’s squad and make up for a disappointing campaign in the regular season, but it would be a nice way for Collinsworth to end his Cougar career after missing out in the Big Dance his senior season. Of course, this won’t be easy. As stated before, Valpo beat St. Mary’s by 16 and held them to 0.75 PPP, one of their lowest totals of the season. The Crusaders can get after it defensively, and if the Cougars struggle to hit shots, that will make things very difficult at MSG. Collinsworth is the key sure, but the Cougars will need perimeter players such as Vandy transfer Chase Fischer and freshman Nick Emery to step it up offensively and defensively if they want to have a shot at winning this thing. Yes, the WCC only gained 1 NCAA Tournament berth this year. But a Sweet 16 appearance and a NIT Championship? Well, that would be something to build on for next year and not just for Rose’s program (he will still have returners in Emery, Kyle Davis, Corbin Kaufusi, and Zac Seljaas next season, meaning they have a good shot to compete for a WCC title next year), but the WCC as a whole. 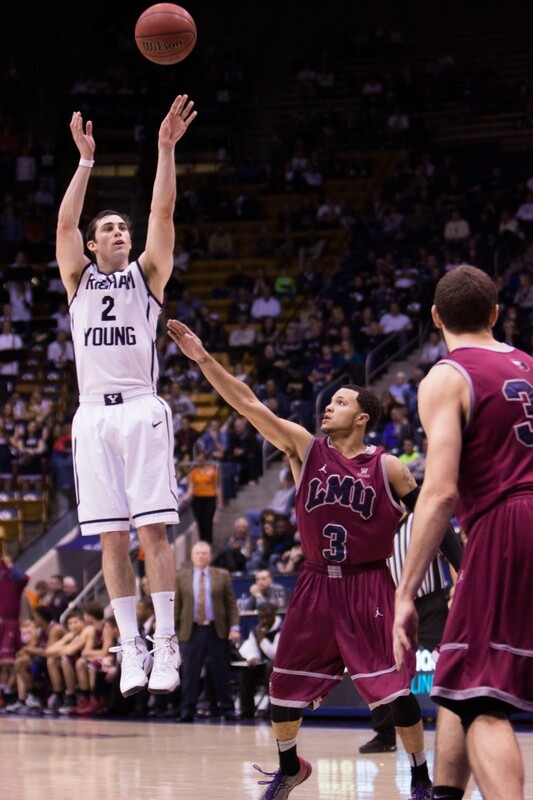 For many BYU and WCC basketball fans, guard Matt Carlino evokes a wide disparity of emotions. Some love his entertaining, shoot-first, shoot-second, mentality, and it has led to some memorable performances (for example, his 28-point outburst a year ago against Santa Clara and his 26 point performance in the Cougars’ win over Stanford, a much bigger win in retrospect than it was thought at the time). However, efficiency wise, Carlino’ struggles with consistency has often done his team more harm than good. In his frosh season, Carlino posted a 95.8 Adjusted Offensive rating on a usage rate of 26.1 percent. In his sophomore year, he let go of the ball a little bit, as his usage rate dropped to 24.2, but it didn’t affect his rating significantly, as it still remained under 100 (which is usually about average) for the second straight year (99.2). The consensus was simple: as entertaining as Carlino could be, his inefficient style certainly didn’t do the Cougars any favors, and he wasn’t exactly the kind of player the Cougars could build around for consistent success either. Nonetheless, due to his experience, Carlino remained a mainstay in the Cougars rotation in the beginning of the year. He started the first 14 games at point guard for the Cougars, and they struggled to find major, lasting success on the court. While they pulled off big wins over teams like Stanford and Texas, they also started off poorly in conference play, dropping their first two conference games of the year against Loyola Marymount and Pepperdine (both on the road but still damaging losses nonetheless). After the loss to the Waves, head coach Dave Rose made a gutsy decision: he made the junior Carlino a bench player. The results for the Cougars? They are 5-0 in WCC play since Carlino was removed from the starting lineup. The Cougars have scored less than 1.20 points per possession in a game only once (against USF), and the recent stretch has been a big boost to their conference-only numbers, as they rate as the top offensive team in the WCC according to Adjusted Offensive rating (118.2). They lead in three WCC offensive categories according to Ken Pom (AdjO, Offensive Rebounding percentage and Tempo), and they rank in the Top 3 in four offensive categories as well (eFG percentage, turnover percentage, free throw rate and two point percentage). Furthermore, unlike some teams in conference (such as St. Mary’s and USF), BYU has showed proficiency not only on the offensive end, but defensive end in conference play as well. They are second in the WCC in Defensive Efficiency (103.5) and rank third in categories such as opponent offensive rebounding percentage and opponent free throw rate, and second in opponent two-point percentage. After a stretch where the Cougars lost four straight games and many thought they were definitely NIT-bound, they have turned it around since the lineup-change and could make a case as an At-Large Tournament team if they finish as expected (Ken Pom projects them to finish with a 20-11 record) or slightly better. That was hard to imagine after they started 0-2 in conference after their loss to the Waves in Malibu and looked significantly behind conference favorites Gonzaga and St. Mary’s (now they are ahead of St. Mary’s in terms of getting an at-large bid). While Carlino has been primarily used in six of the ten lineups listed, he has not been used in the the top-two most played lineups. Thus, Carlino is not a “Ginobili-type” in the sense that he is a starter simply coming off the bench due to aesthetic or “strategic” reasons. Rose has preferred sophomore Kyle Collinsworth at the point for more of the critical minutes in the past five games, as evidenced by him running the point in the top-two most used lineups. It’s hard to argue with the success as the Cougars are 5-0 in this span and playing some of their best ball of the season during this stretch. But, this shakeup has turned out well for Carlino in terms of him improving his efficiency on the court. In the 14 games Carlino started this year, he only had five games where he posted offensive ratings in the triple digits. In the five games that Carlino has come off the bench, he has posted four games with ratings over 100, including a 150 rating against Santa Clara where he put up 15 points and 9 assists in only 24 minutes. Thanks to the recent stretch, his adjusted offensive rating has boosted up to 100.7 which would be a career high, and his turnover rate has dropped to 16.9 percent, which would be a career low, if the season ended today. If you think about it, it is surprising Rose did not resort to this strategy sooner. Carlino, with his high usage rate (team high 28.1 percent) and high shot percentage (29.1), is the kind of player that can really spark a squad off the bench. He can bring instant offense in a short period of time, and he has the potential produce highly efficient numbers in a short period of time. However, when his minutes spread out, his efficiency becomes more inconsistent, because high-shot, high-usage players don’t carry consistent success over a long period of time unless they’re truly elite players (example: Carmelo Anthony can pull it off, but Ricky Davis cannot). While Carlino is good, he is not that kind of player skill-wise or athletically to do it over 30-plus minutes. But in 25 minutes and under? Carlino is the kind of player that can not only boost a team’s offensive output, but also allow the starter’s to get rest without the coaching staff worrying about the offense taking a step back with them on the bench. Carlino’s role when he was a starter was always questionable because he wasn’t the kind of player efficiency-wise that could carry a team, but in more limited minutes and as a sixth man? He’s been the kind of player that has made BYU the most dangerous team right now in the WCC as well as a legitimate threat to challenge top-dog Gonzaga in the WCC Championship race. Of course, Carlino is not the sole reason the Cougars have experienced success. Tyler Haws has also been a key reason for the Cougars’ wave of success as he is posting a 116 offensive rating with a usage rate of 26.4. Furthermore, Collinsworth, with his size (6-6) and efficient play 109.5 rating and 24.6 assist rate) has filled in admirably in the starting point guard spot as only a sophomore. Despite those standout performances however, it is obvious that Rose has found the right formula for the Cougars to achieve WCC success centering on his decision to have Carlino coming off the bench. Carlino is the kind of player that can not only torch opposing WCC reserve guards, but he can also match up decently well against starters when in a pinch, which makes his role as a reserve more valuable than as a starter. Sure, his minutes have gone down (his minutes percentage has fallen to 68.4 percent, down from 71.8 a year ago), but his role serves the Cougars much better now than it did in the first 14 games of the year, and their record in that stretch has confirmed that. That may be tough to swallow for the former UCLA commit (after all, nobody would outright prefer to be a bench player than a starter), but if the Cougars ride this current rotation to a NCAA Tournament appearance, I’m sure Carlino and the Cougars program will be satisfied in retrospect with the changes that may have tapered from the pre-season expectations (which was for Carlino to probably be the team’s centerpiece). I’m not going to go into to much detail here on these reports. These are more just to familiarize WCC fans with some players who are on the horizon and spur some discussion about what players are going to have an impact in the coming years. There will always be video on the recruits, which is important because I want people to gain their own impressions from what they see on tap and furthermore, in this day and age of media an technology, is pretty easy to acquire. The first on the Recruit Report is TJ Haws, a top-100 national prospect according to ESPN.com committed to play at BYU next season. He is a local kid from Highland, Utah, so it is no surprise that he has committed to Dave Rose’s program. Rose has traditionally produced some good guard products out of Provo (Jimmer Fredette the prime example), and Haws looks like he could fit in well witRh the Cougars’ up-tempo, offensive-heavy system. T.J. is a scoring sniper from anywhere on the floor. He is the type of prospect who will thrive in a system like BYU. He also will be able to play both guard positions for the Cougars. Haws is a long and lean wing that is very productive and competes on both ends of the floor. He has a excellent mid range game. He knocks down mid range jumpers off the catch or dribble and is a very underrated driver/slasher. The BYU bound point guard is a playmaker. He can be a dangerous scorer because of his jump shooting and toughness off the dribble. Changes speeds, is elusive and fires up crowds with his at times flashy passing. Just has to get stronger. Haws could be next in line in the tradition of great guards who have come from the WCC, as he displays all the skills and abilities of a good point or shooting guard. On the surface, Haws doesn’t look athletic, but he is very crafty not only in his ability to get to the rim and create his own shot, but in creating for others as well. On the tape, it looked like there were some matchups where he might have been at a disadvantage, but he is very quick with the dribble and he has good vision with the ball, as he was able to find the cutting open man with ease if defenders collapsed on him. His jump shot is consistent-looking and smooth, and he is able to shoot well off the dribble from what I’ve seen on tape, and his release is quick enough to where he only needs a little bit of space to get a successful shot off. His size is a bit of an issue since he is thin at 170 pounds, and many scouts have noted that he needs to add strength. I don’t think this is too pressing a negative since college programs are usually good at strengthening players once they get to campus. Overall, Haws looks to be an entertaining player worthy of his Top-100 status as a recruit, and he certainly will make the Cougars a competitive and dangerous team in 2014-2015. Want the Latest Flannel, PBR and PER? Enter your email address to follow FPPand receive notifications of new posts by email.